Last two days Nifty futures made a down swing of approximately 200 points (from 10530 to 10330 levels). Interestingly on the weekly charts nifty had made a outside bar with a low confidence breakout. It looked below the previous week low 10350 and failed to accept below previous week low on EOD basis. Trading sentiment is negative for the last two trading session. But one needs to be cautious as the market internals are bullish. Nifty futures is in a phase where even a sharp cuts will be followed strong pullback rallies. 10300 puts writers are actively supporting and defending 10300 (on nifty spot) on EOD basis and on the other side 10500 and 10600 call writers are actively writing calls on the higher side which lead to a possible 200-300 point sideways zone for the next 1-2 weeks. Again re-interating that positional shorts for November series might be short lived and might not favored much for this series. 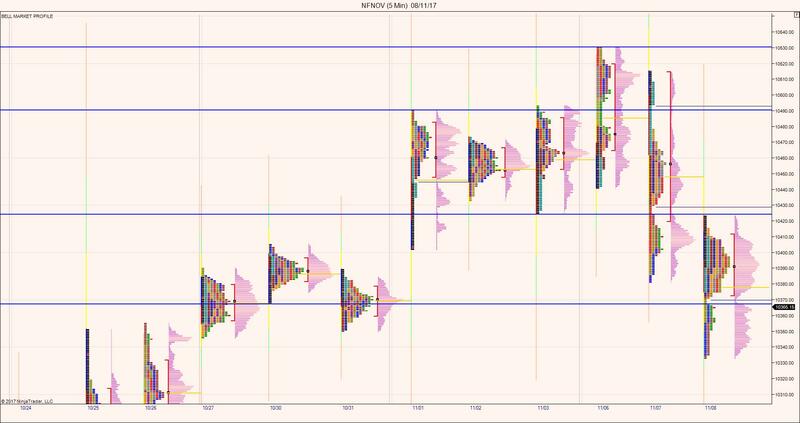 Nifty formed a triple distribution on Tuesdays trading session followed by a double distribution on Wednesdays trading. Wednesdays trading is completely dominated by short term sellers with possible stops built around 10410 levels. Any price acceptance above 10365 will bring more positive bias towards 10430 levels. 1)Value formed lower but the sellers are not serious yet on Fridays trading session. 2)Inventory correction happens in the form of multi distribution for this series (Triple and Double Distribution).